As told to one of our major sponsors, Ethiopiaid. Tigist is an articulate and quietly spoken girl, who joined the Blind School in 2009. Her favourite subject is civics. Her teachers report that she has had a good academic performance since joining the school. Tigist lost her sight aged 1. Only her uncle knew where to send her to get the specialised support she needed. The rest of her family wanted her to stay at home and told her that if she left, they would not let her return. However, once they visited the school, they realised how much it was helping Tigist and that being blind need not stop you from being successful and getting a good education. She told us that she sees her family once a year, in the summertime. They come and take her home for 2 weeks or up to 2 months. In the meantime, they speak regularly on the telephone. It is clear that she misses them, however she has many friends at the school who help keep her company when she gets sad. Improved and wider educational knowledge – she has access to many subjects and can listen whenever she wants. Joined the school in 2012. For the first few years, Hailemariam struggled with education and fell behind. He tells us that he now understands the subjects well. His favourite subject is Amharic. 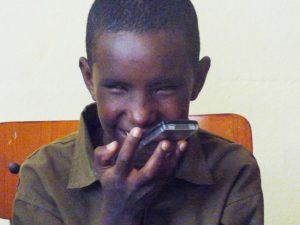 Before he came to the school, Haile didn’t know anyone else who was blind. He lost his sight aged five and his family told him that this meant he would never be successful. A neighbour referred him to Mekelle Blind School and it was when he first met other children with similar visual problems that he realised he was not alone. Hailemariam recently came second in his class. He enjoys plugging in headphones and studying hard. I asked him what his favourite thing about school is, and he said it was both the library and time spent playing with his friends. He wants to be a legal professional when he leaves the school and thanks Ethiopiaid supporters for the opportunity to make something of himself. Went blind aged 2. Said he grew up feeling useless. His family took him to a spiritual area to bathe in holy water, but this did not restore his sight. Kifle was told about an NGO that could help him, but was mistakenly directed to Mekelle Blind School. He says this turned out to be a good mistake! Kifle joined the school in 2013 and is very academic. He is now in grade 5, which is 2 years ahead of his same-age peers. Kifle’s favourite subject is social science. Kifle wants to become a lawyer when he finishes at the school. He says he will come back and support the students.